"I just want to get back to being my `abnormal normal' self..."
Overcome Anxiety/Panic Attacks for the Client. Resource for Professionals in the treatment of Generalized Anxiety Disorder, Anxiety Disorders, Anxiety Attacks Panic Attacks, Agoraphobia (misspelled as agrophobia), and associated Depression. "I just want to get back to being my `abnormal normal' self," cried the client with whom I discovered this technique--more about that later. Yes, there can be freedom from generalized anxiety disorder, agoraphobia, anxiety attacks, and anxiety disorders and this is the one program that takes one in the right direction for the treatment of anxiety attacks and anxiety disorders. It's different than anything you could imagine which is why it's the one approach that really gives you a chance at freedom from Anxiety Disorders, Generalized Anxiety Disorder, and Anxiety Attacks. It doesn't matter how long you've had anxiety disorders or how severe your anxiety attacks are, this is the approach to success. Click here for a description of the different types of anxiety. After you see your physician*, there are five things any successful program to overcome anxiety disorders should have. 1. zero emphasis on relaxation or breathing. Sure some learn to get rid of anxiety by taking stress management programs where they learn to breathe, but all the more often, 80% don't. It's the difference between inward and outward concentration and while most stress related problems are helped by learning inward concentration, anxiety disorders, anxiety attacks, and generalized anxiety disorders are not helped with inward concentration. In fact, far greater, I mean far greater results are obtained with outward focus or outward concentration techniques. So stop feeling guilty that you find it difficult to relax and calm down when you are feeling anxious. This program focuses on external focus so you never have to relax to demonstrate your progress, instead you will naturally relax as a side effect of external focus. 2. Nutritional awareness. Yes, it's important to look at what you are eating. What you're eating could be contributing up to 80% of your problems. This program provides insight into how you can keep your eating habits from causing anxiety disorders. 3. Personality. Early on, I was told by several psychologists that those suffering from anxiety disorders, anxiety attacks, and generalized anxiety disorders were irresponsible individuals and used their anxiety for secondary gain, in other words get out of something like test taking, going someplace uncomfortable, seeing someone they didn't want to, chores... and not the type of person you'd want working for you. I've since learned that those psychologists were "full of it." Fact is, that those suffering from anxiety disorders, generalized anxiety disorder and anxiety attacks are really very responsible individuals--the type of person I'd want working for me. In fact, it's their responsible nature that determines how they react to stress with anxiety disorders. Any successful program in dealing with those suffering from anxiety attacks, generalized anxiety disorder, and anxiety disorders must address the responsible nature of the individual to provide options for them in their everyday duties and relationships. This program is the one program that does this. 4. Control. Most programs focus you on gaining control of your life. While that may seem like a desirable goal, for many reasons, it simply complicates matters and leads more often to failure. This program teaches you to "flow with it" rather than to "control" things. Sure to the uninitiated, a person who "flows with it" might look like he's really great at controlling his life, but not so. It's the subtle difference that makes "all" the difference in freeing oneself from anxiety disorders, anxiety attacks, and generalized anxiety disorder. 5. Disappointments. Your expectations play 100% into your disappointments. And guess what, usually when there is disappointment, there are some emotions such as frustration, confusion, uncertainty, boredom, irritability, depression, anger... Zero programs that I've looked at handle this all important fact. It's like somehow you're just supposed to know how to deal with these emotions and resultant disappointments. This is the one program that arms you in the handling of everyday emotions and some "not so everyday" feelings. Just because you've been walking and breathing on earth for all these years, you're supposed to know how to breath in space? Unless the program you are using addresses all five of these points, it will be no more successful than placebo--about 30%. This program has a demonstrated success rate of 80%. And depending on the severity of your symptoms, it may be best to integrate it with your therapist by giving it to him for guidance. A two hour dvd for the client, listed below, as well as a five hour training dvd for the therapist, also listed below, are available. Yes, my first client with whom I discovered this technique did get back to her "abnormal normal" self, except she ended up being more normal that abnormal in that her disappointments had solutions. But quite honestly, don't order this program unless you're willing to play it over and over and over again on a daily basis. Let your ears hinge on every word spoken. It's like this, I am a pro at discovering these techniques, yet I've been the world's worse marketing person (obvious since I'm not on Ophra Winfrey yet) so I began acquiring cd's to improve my marketing skills. The methods--although obvious to marketing geniuses--are quiet alien to my way of thinking. So I listen to the same program fifteen, twenty or more times and still hear new things being said after pages and pages of notes. Get the picture? If it were something as simple as adding cream to coffee to make it taste better, you wouldn't be reading this. If you watch the dvd once and free yourself of anxiety, you're blessed. If you watch the dvd 50 times and free yourself of anxiety, you're blessed. The cd is full of many case histories from which one can identify and learn. Overcome Anxiety/Panic Attacks for the Client. 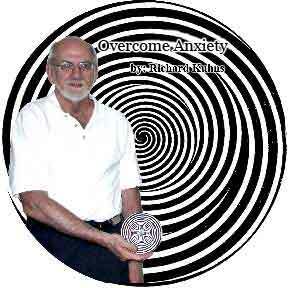 $99.95 $69.95 Pt I & Pt II -- 2 hr dvd plus 2 cds and Light at the End of the Tunnel for Anxiety/Panic sufferers plus 15 minutes telephone consultation. How to deal with the mind's desire to test your improvement along the way. Light at the End of the Tunnel E-book--a $39.95 value. Why anxiety as opposed to headaches (how personality plays a factor)? Difference between "Flowing with it" and "Control"
The power of Wakened Hypnosis and the magic of observation and the dangers of conclusions. Disappointments and the connection to anxiety. 2 programs (includes Part I and Part II) for $39. ea. Overcome Anxiety/Panic Attacks for the Professional. *This approach is not intended to replace effective or proper medical treatment, rather it is intended to augment medical treatment. A three hour workshop entitled "Wakened Hypnosis in the treatment of Anxiety and Panic Attacks —New Treatment For Anxiety, Panic Attacks And Associated Depression" were again presented by Richard Kuhns B.S.Ch.E. at the National Guild of Hypnosis, NGH, national convention in New Hampshire Aug 2007.
to obtain information regarding registeration for the convention. Generalized Anxiety Disorder: Generally a low level anxiety that may manifest itself in typical and atypical symptoms. Typical symptoms are sweaty palms and arm pits, butterflies is the stomach, generalized feeling of anxiousness, difficult upper chest breathing, and an extreme desire to get away from where ever one is. Excuses are made, i.e., go to bathroom, get air, and so on. Atypical symptoms can be something like digestive difficulties. Typically, a certain stimulus such as a specific location, person, event, or thing may bring on the anxiety. Untreated, the anxiety becomes generalized to other stimuli. Usually when the sufferer gets away from the stimulus, the symptoms subside. Panic Disorder: Also known as a panic attack. The sufferer has heightened levels of anxiety with an ultra sense of danger--a tremendous fear of losing fainting . Breathing is very tight and upper chest (thoracic), extreme muscle tension in the chest region. In extreme situations, pain in the chest radiates out the arm and mimics a heart attack. Likewise, a particular stimulus brings on the panic and if untreated it may become generalized to other stimuli. Usually when the sufferer gets away from the stimulus, the symptoms subside. Agoraphobia (misspelled as agrophobia): Panic disorder specific to open spaces. The first experience occurs in a large store, parking lot, or some such location. Soon, the sufferer develops a fear of open spaces (stimuli) and just being in the proximity brings on an panic attack with an overwhelming feeling that he/she will faint. Usually, as they get away from the open space, symptoms subside. Untreated, the agoraphobia generalizes to other open spaces. Free Floating Anxiety: This anxiety, either typical or atypical occurs without any particular stimulus and seemingly for no apparent reason with all the same symptoms and fears as with generalized anxiety. Why does the anxiety become generalized? Usually the first experience with anxiety takes one off guard and is a surprise. Without direction and supportive counsel, the person begins worrying about what could be wrong with him/her. They begin planting suggestions (of course by accident), i.e., "What will I do if it happens when I'm doing such and such?" They remember the feelings and wonder what they would do it they happened while giving a talk, or trying to explain themselves, or while getting on a train, or ..... Before they know it, what they fear is happening and they become more and more afraid of losing control. Phobia: The feelings a phobic feels may be exactly the same as the agoraphobic or the person suffering from panic disorder feels. In fact, using biofeedback instruments, one could not tell the difference between a phobic, agoraphobic or panic disorder. However, the phobic's reactions are to a specific stimulus, i.e. the fear of heights, bridges, closed spaces, dentists, and so on. If one is successful in eliminating the stimulus, then you have a perfectly normal person. Not to say, that one may not have more than one phobia. Even though the symptoms are very much the same, the path to recovery is entirely different. Diagnosis: Diagnosis can only be made by a trained medical or mental health professional. Self diagnosis can be misleading and costly in taking one down the wrong path. How to deal with anxiety disorder, panic disorder and agoraphobia: The most effective approach in dealing with anxiety, agoraphobia, and panic attacks is to seek a medical help and counseling simultaneously. Your physician will prescribe something like valium, zanex, or zolof (if there's associated depression). Let's not get confused. We're not just talking about simple butterflies in the tummy, this is the kind of anxiety that sends the sufferer to the emergency room with what is believed to be a heart attack only to be released hours later with a clean bill of physical health, a diagnosis of anxiety, and a lot of mental confusion, anguish, and disbelief. Disbelief in that they (the doctors), must have missed something. Eventually, this person gets the message and seeks a psychologist or psychiatrist for the treatment of anxiety disorder In some cases, things get so severe that hospitalization is necessary. The person may say, "I was living my abnormal normal life until such and such a day and then all hell broke lose and I haven't been the same since then. I just want to get back to my abnormal normal self." There is good news and there is bad news. The good news is that once one is willing to get beyond self berating and face disappointments in life, the symptoms literally disappear. The bad news is that sufferer often creates expectations from the path to freedom that set him/herself up for failure. However, when one realized that he/she can only fail when he/she refuses to learn from mistakes, then additional good news emerges and the path to freedom from anxiety attacks becomes its own test from which the sufferer of anxiety disorders and panic can pass again and again until he/she can literally forget what it felt like to ever have had the problem. Let's be honest. If your patient suffers from panic disorder (panic attack) it's unlikely that this or any program will eliminate the symptoms by itself and it's unlikely that any medicine or supplement by itself will either. Yet with prescribed supplements or medicines and this program your patient may save months or years ineffective of therapy (counseling) and thousands of dollars in freeing themselves of anxiety disorder, agoraphobia and anxiety disorders. The key is to direct the counseling in the right direction. Unfortunately most counseling is rather nonspecific and literally years of your patient's life can be wasted in therapy. This is the one program that is specifically orients you and your patient in the right direction. In fact, if your patient happens upon this program before you, he/she may use it to direct your counseling and when you asks, "what would you like to discuss in this session?" he/she will have a pertinent answer rather than talk about the first thing that comes to mind. As you know, your patient's attitudes contribute to his/her state of mind? It's well known that attitudes can make you happy, unhappy, upset, bored, excited... And specifically, a long history of suffering from generalized anxiety disorder and or anxiety attacks can result in depression. And this depression spurs more anxiety--a cycle that never seems to end. 1. get away from conclusions and switch to observation. 2. identify the disappointments in one's life. 3. learn to master dealing with disappointment and turn each one into an opportunity. The power in the program is the combination of wakened hypnosis with a cognitive shift. This program uses hypnosis to enable your patient to identify the disappointments and deal with them honestly. That honesty will set you free. As the popular commercial says, "think outside the bun." You patient learns to think differently. The dvd in easy to understand terms contains everything necessary to overcome anxiety. This dvd should be given to each patient to reinforce your first working session with the patient. It empowers your patient to become his/her best friend instead of being his/her worst enemy. The fear response is dissected in easy to understand terms such that your patient will move from attempting to control stress to learning how to flow with stress. Your patient will understand how his/her personality feeds into the panic response. Most importantly, the relationship between disappointment and panic attacks is explained thru which your patient can successfully refocus away from the flight response and deal with the real stresses and turn disappointment into opportunity for in reality life is often more about handling the disappointments than it is about the plans we make. And for the patient that feels forsaken by God--life takes on new meaning as they free themselves from self incrimination and obsessing about the thing they did for which they're being punished. The cassette tape gives many case histories of how patients refocused for pointing the direction away from panic to the real issues from which you can build value in your therapy sessions. Suppose you can't be hypnotized? Most think of hypnosis as staring at a focal point, while someone suggests that your eyes are getting heavy and heavier as you eventually close your eyes and go into a trance. This program does none of that--wakened hypnosis is used. You never have to close your eyes or even relax. In fact I've found that kind of hypnosis counter indicative to obtaining results. In fact that kind of hypnosis can cause panic. Wakened hypnosis, on the other hand, is done simply through the power of specifically designed suggestions without relaxation or eye closure. For example, suppose we wanted to have strangers exiting a building gaze skyward. Would we suggest that they look up because of some reason, big cloud or whatever? You could suggest that, but the response would be minimal because we don't trust strangers and we'd wonder what the ulterior motive was. However, if located ourselves at a certain position within their view as they exited the building and timed ourselves to look up our self, most of these strangers would be curious about what we were looking at and would look up themselves. Because we modified their behavior, they accepted this form of hypnotic suggestion which is a form of wakened hypnosis. Obviously, our goal with generalized anxiety disorder and anxiety attacks is quite different than having strangers gaze skyward, none the less, wakened hypnosis gets you thinking, "outside the bun." And for the most part, you might say, as you listen and begin working the program, "there's no hypnosis, it's just plain old common sense!" And believe me, what's been, "outside the bun," has been there all along. How quick are the results? All in all, everyone is different. One out of 30 people who listen to this program just once free themselves of anxiety disorders and as if by magic. With all that they've done, the program is the catalyst that makes it all make sense. But don't expect it to work that way for every patient. Some patients may not be that far along the path or they have been going in the wrong direction and it may take a few weeks with intensive counseling or therapy to put it all together. And then again, regardless of how many years your patient has suffered, or how severe the symptoms have been, he/she might already be on that path far enough such that this program is the catalyst for miraculous results. Overcoming Disappointment ultimately is the focus for which success is accomplished. To only focus on getting rid of anxiety thru technique is akin to using a band aid a deep laceration. By learning to overcome disappointment, anxiety dissolves. Of course the guidance from point A to point B is what makes it possible. No other program uses this approach and no other program produces these dramatic results. Instruct your client to think "outside the box" for total success. What about Guarantee? Go ahead, order the program, use if for a full 120 days and if you feel you haven't gained value, or it doesn't do what I say it will, return it for a full refund within 120 days of having received it. Note: no refunds are given on programs returned before the 30 day period has passed and none given after 120 days of having received the program. The cd is replete with many case histories from which one can identify and learn. ©Copyright 2003 Stress Management Institute, Middletown, NJ all rights reserved.